iT7 Audio iT7x2i review | What Hi-Fi? iT7 Audio popped up around four years ago with one of the less likely celebrity headphone tie-ins: ex-Aston Villa player Ian Taylor. As endorsements go, it wasn’t quite Dr Dre - but at least the era of celebrity headphones is more-or-less over. The iT7x2is are a new version of the iT7xs we tested back then, but with a lower price and a classier design. While not category leaders, they are a good buy for those who want wireless headphones without spending a packet. The iT7 Audio iT7x2is are full-size wireless headphones with just enough pizzazz to let them fit in next to big-brand pairs at twice the money. They are mostly plastic, but there’s a thin veneer of brushed aluminium on those parts of the headband not covered with padding. It’s there to make sure, pretty much every time you touch the iT7 Audio iT7x2i, you touch metal rather than cheap-feeling plastic. And, well, it’s on show too, which is just as important. The headband and ear pads use standard fake leather-topped foam padding, and it makes these headphones very comfortable as long as you don’t have huge ears. iT7 Audio has juggled the priorities of keeping the cups small enough to look good, but large enough to mostly encompass most ears. The bottom of your earlobes will sit under the pad rather than in it, but it doesn’t impact on comfort. It’s the same case with headband tension. The iT7 Audio iT7x2i are not as light as the Bose QC35, and aren’t really intended for use during vigorous exercise. But they won’t fall off as you walk around – you may even be able to get away with a light jog. There’s a good amount of customisation to the fit as well. The cups swivel two ways, letting them fit any head, and the headband also folds up for easy portability. Given the price, the iT7 Audio iT7x2i also have a solid array of features. These include Bluetooth using a Bluetooth 4.0 chipset, and they have NFC for easy pairing and aptX codec support. Bluetooth reliability is good, and battery life of 14 hours is about the minimum you’d expect from a full-size wireless headphone. The battery is charged using a microUSB port on the right cup, and there’s a 3.5mm jack for listening when it’s flat. There’s a cable supplied in the box, but it’s an odd one. At each end there’s a long, gold-coloured metal sheath. As it pokes out from the bottom of the cup, it catches against up-turned coat collars or scarves. During winter, then, you might want to make sure you keep the battery charged. The iT7s keep their controls on the back of the right cup, a trio of plain and practical plastic buttons. The lower pair alter the volume, and the third acts as a play/pause and power button. There’s no track-changing on the headphones here. A mic lets you take calls, though. There are no spectacular elements to the iT7x2is. 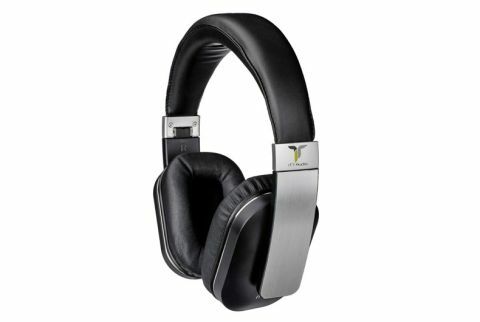 Their aim is to offer the basics of good wireless headphones at a much lower price than the big-brand competition. The sound quality won’t blow away those already familiar with good-quality headphones, but there are no car-crash elements to detract from the impression of these as solid everyday wireless headphones. IT7 Audio has aimed for a mainstream sound signature, with typically rotund bass that fills out the sound in a way many casual listeners will appreciate. However, it does bleed into the midrange a little, and there’s also quite a lot of mid-bass filler. It’s not every day you hear Kate Bush’s most reedy of vocal lines causing a chain-reaction of mid-bass burble. The more common manifestation is that more complex arrangements sound a little busy, and vocals can sound separated from the rest of the mix. The Urbanista Seattles are in another league in this respect, with significantly better separation and inter-register definition - although the larger iT7x2is have a slightly larger, more breezy soundstage. This is no surprise, as they are the bigger of the two. The iT7 Audio iT7x2i lack a little discipline, but are otherwise a pleasant and fun listen. They also sound full and fairly rich, and the treble is reasonably well resolved without getting remotely close to a sibilant or harsh edge. At times the upper-midrange can honk a little when pushed with challenging material, but it’s slight. So these aren’t the best-sounding wireless headphones at the price, but they certainly outdo some of the competition - and that includes Sony's MDR-XB650BT, which many may assume to be superior. The iT7xX2i have better-sounding bass, and are absolutely worth considering if you want an affordable, bass-led full-size wireless pair. The iT7 Audio iT7x2i have many positive points. They are comfortable, their superficial metal parts add class to the look and feel, and the sound quality is satisfying if you keep your expectations in check. These are not hi-fi headphones and aren’t the best for the gym either, but they do have a thick, powerful tone that can tackle ambient noise well. They’re a convincing argument that, particularly in ultra-competitive fields like wireless headphones, it’s often a good idea to stray off the path and check out some lesser-known options.